Few sources for family history can be more appealing than the Birthday Book. These small-size, intricately designed, volumes were very popular among the middle and upper classes in the late nineteenth and twentieth centuries. Indeed, Birthday Books were so much in demand that a variety of publishers in Scotland’s big cities vied to produce the most attractive format. 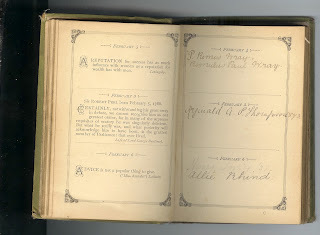 Birthday books tended to be kept by women rather than men, so if your ancestor was the wife or daughter of an Edinburgh banker or lawyer, a Glasgow industrialist or a Scottish laird, it’s possible that she may once have owned a birthday book and that what she wrote in it may help you to find out more about your family in the past. The Victorians celebrated birthdays with more gusto than previous generations- parties were held, for instance, with cards, cakes and games. It was important that birthdays were not forgotten. Birthday books often included the birthdays of large numbers of friends and family recorded over a long period of time. One I came across recently was purchased in the 1880s but included entries made as late as the 1960s. Originally birthday books were bound in leather or red morocco; many had gilt edges and ornamental printed endpapers. Those that have survived are often broken at the spine, dog-eared and held together with tape, attesting to many years of use. They were sometimes interleaved with lined blank pages for notes. At other times smaller spaces were left for entries between illustrations and quotations. Whatever state your Birthday book is in, read it very carefully. 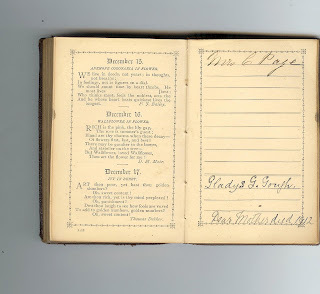 Like the Family Bible, it may have provided one of the few places for your ancestor to record important family information over several generations. As Birthday Books were reasonably expensive, they were often given as gifts from one family member to another (usually for a birthday or at Christmas). Check to see if there is an inscription at the front of the book which might help you establish who owned it. 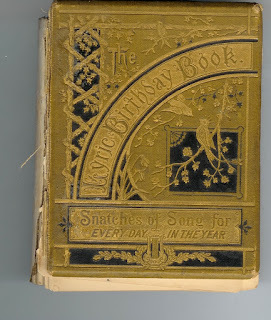 Owners of birthday books often mentioned their relationship with the people whose birthdays they recorded. Entries such as ‘John Andrew McWilliams, great nephew’ for example, can be very useful if you are trying to fill in names on the branches of your family tree. Read each entry carefully as sometimes extra genealogical information is included alongside the name. 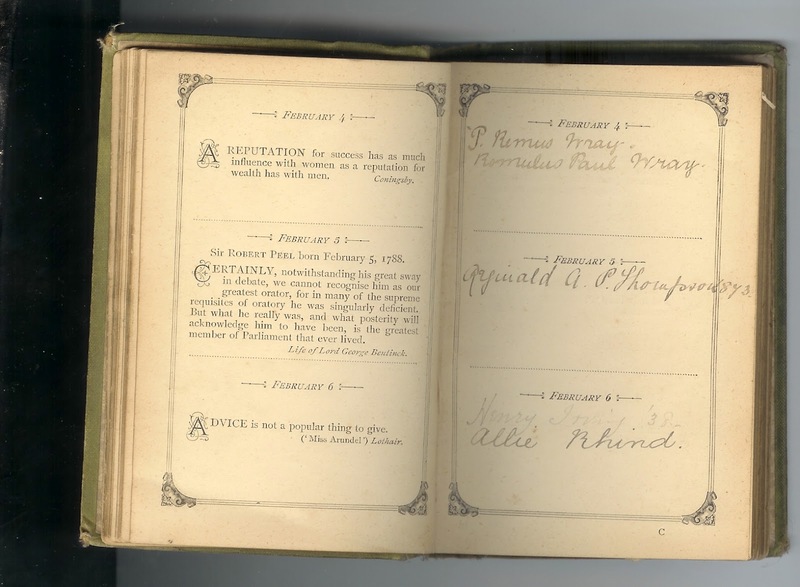 In the book (pictured here) the name of ‘Arthur William Pierce’ is written as one of the entries for October 21st. The writer also helpfully recalls Arthur’s year of birth 1915 and the year of his death 1948. This entry, therefore, provides several pieces of useful information all at once. Entries may also record the age of a relation – sometimes recorded in brackets or after a slash. In these cases, you need to ascertain in which year the book was used – look at the date of publication as a guide. All this can, of course, be helpful in the search for birth and death certificates. The Scott Birthday Book (1879) which includes quotations from the works of Sir Walter Scott. This page mentions the birthday of twins Romulus and Remus alongside the birthday of the writer, Henry Irving. 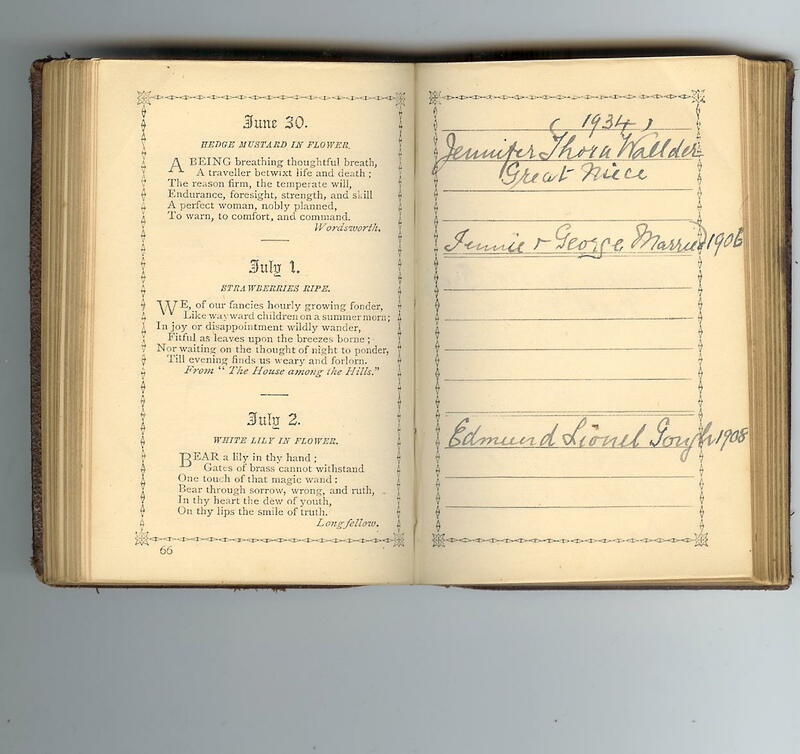 Deaths as well as births were sometimes recorded in birthday books - This one records, Dear Mother died. The Birthday Motto Book and Calendar of Nature, Frederick Warne and Co. 1871. Sometimes, the owners of birthday books would ask friends and relatives to sign their own names. Indeed, some books actually requested contributors to sign the relevant page. In this way, birthday books double up as autograph books. If you have genuine signatures, you can attempt some analysis of handwriting. Ask yourself, for instance, if the script is confident and assured or small and hesitant. This may indicate something about your ancestor’s personality. Turn the pages upside down to get a better feel for the flow of the writing. This page records the relationship between the writer and her ‘great niece,’ Jennifer Thorn Walder, born 1934. The Birthday Motto Book and Calendar of Nature, Frederick Warne and Co. 1871. With a large number of English birthday books also on the market, Scottish publishers looked for unique selling points to make their books more attractive. Some celebrated the nation’s literary talent, for example, Auld Acquaintance: A Birthday Book of the wise and tender words of Robbie Burns (compiled by James B. Begg a grandnephew of Burns) was published by the Edinburgh publisher William P. Nimmo in 1883. And The Scott Birthday Book, which contained quotations from the works of Sir Walter Scott was published in 1879. Some Scottish birthday books celebrated the nation’s dual culture. 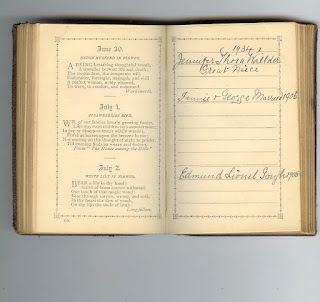 The Highlanders Book of Days: A Birthday Book in Gaelic and English was published in Edinburgh by Maclachlan and Stewart in 1885, for instance. These Scottish birthday books joined a large number of English-produced Birthday books which promoted other nineteenth-century novelists and poets including: The Robert Browning Birthday Book (1896); The Byron Birthday Book (1879); The Charles Dickens Birthday Book (1882); and The Tennyson Birthday Book (1900). 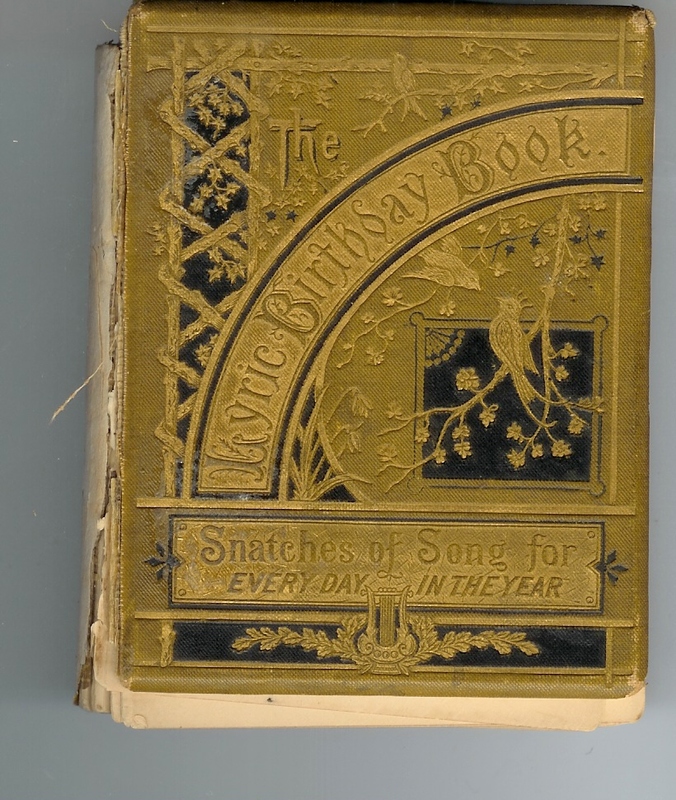 Since birthday books were available in a wide choice of formats, the particular type of book owned by your ancestor may well say something about his (or more likely her) religious interests, literary tastes or other predilections. 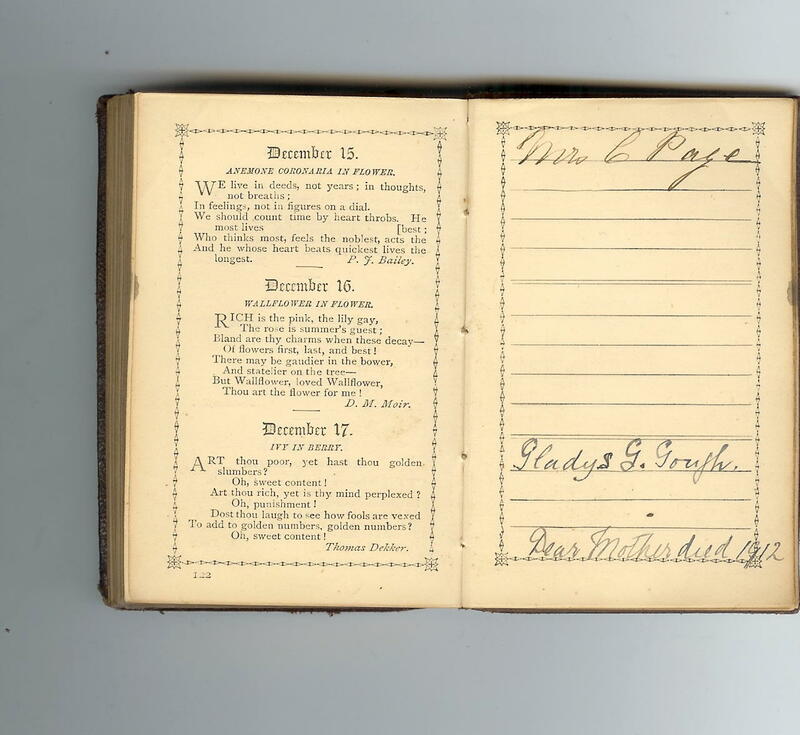 If your ancestor owned the The Temperance Daily Text Book and Birthday Record of 1883, for instance, you might conclude that his or her family had taken the pledge. 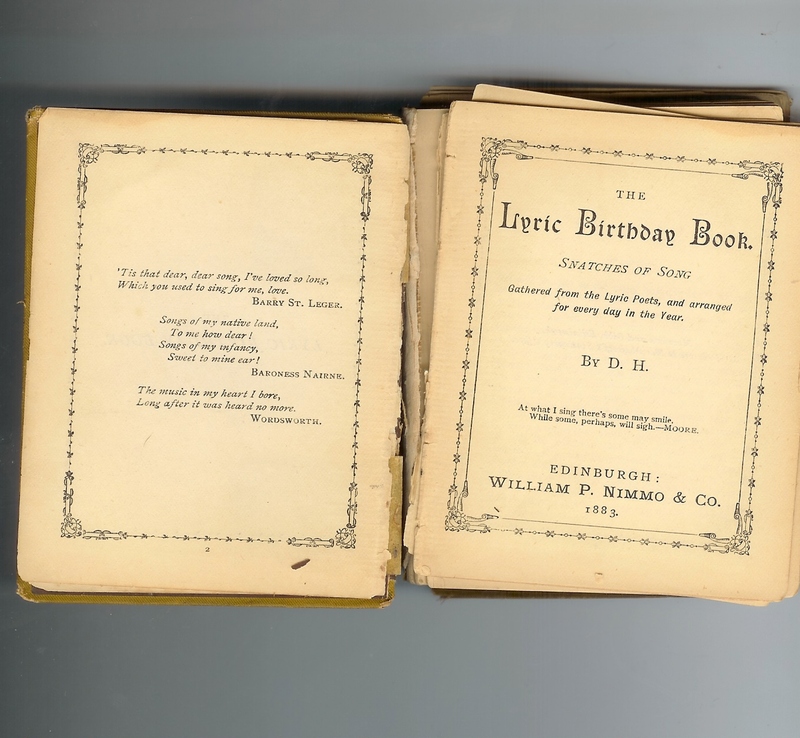 For those of a jollier temperament, there were a number of appealing Scottish titles including: The Birthday Book of Riddles and Guesses by Mary E. Donald (1918) and the anonymous Birthday Book of Wit and Humour, 1879 (both published by Nimmo in Edinburgh). Whatever your ancestor’s interests, there was probably a Birthday Book out there on the market to satisfy it. English publishers were also producing Birthday books with themes as disparate as Empire, foxhunting, suffragettes, cricket and astrology. The format of your birthday book should either tell you something about your ancestor, or about the times in which he or she lived. If you have the good fortune to come across a birthday book among your family papers, treasure it. If you don’t, why not search for one online. A number of birthday books often come up for sale on the second hand book site www.abe.com and on the auction site www.ebay.com. It’s just possible that your family birthday book is out there somewhere and that it might just contain the clue you need to take you on through censuses and certificates to discover more about your family’s past. www.copac.ac.uk A full list of Birthday Books published during the Victorian period and beyond can be accessed through the search facility here. www.abe.com Birthday Books for sale on the internet. www.ebay.com the internet site where you might find your family birthday book up for auction.